Udupi, Jan 9, 2017 : A group of three enthusiasts from California in the United States are on a unique mission. 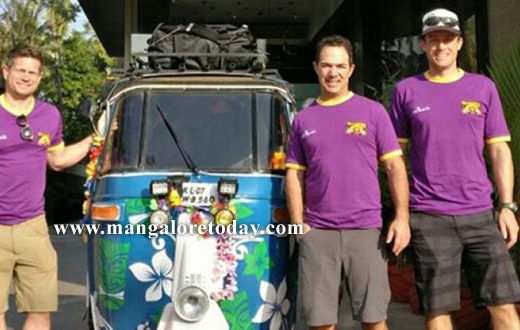 They are traversing India in an autorickshaw with the objective of creating awareness on environment protection and child welfare while also raising funds for the cause. The team led by Terry Allen Blesso has Trent Stanton and Stuart Lee Vaganor. The team which commenced its journey from Kochi in Kerala on January 2, will conclude its mission at Jaisalmer in Rajasthan on January 15. The team which arrived in Udupi recently visited various parts of the town before leaving for Goa. The Adventurers Club of Kerala has lent a helping hand in this mission. It is a good concept of creating awareness among the people about the various problems faced in the country.